When you are out on the water searching for your next catch, your eyes are the most valuable tool you can have. It’s important for guys to protect their eyes when they are fishing. Not only is the sun beating down on you, but the added reflection of light off the water can do some serious damage to your eyes. To make sure that your vision stays sharp even after you’ve reeled in your big catch, you should invest in some quality sunglasses. There are a number of reasons why fishermen should wear sunglasses, the biggest being protection. You only have one pair of eyes, so it is important to protect them at all costs. Sunglasses help to protect your eyes from harmful UV radiation. Prolonged exposure to this radiation can cause a number of undesired health effects. Guys who spend a lot of time near the water are prone to getting cataracts early on. They are also at risk of experiencing growths on the eye. Sunglasses also help to protect the eyes from other dangers. Whether you are fly fishing on a moving river or lure fishing on a lazy stream, hooks are bound to come flying towards your face at some point. While most fishing enthusiasts don’t realize it, eye injuries from a hook are fairly common. With sunglasses, you have a protective barrier that will keep you out of harm’s way. Sunglasses also do wonders to improve your overall vision while fishing. With the water reflecting light into your eyes, heavy winds causing you to squint, and dust flying in every direction, your vision can become a bit hazy. With a pair of sunglasses, you’ll be able to spot your game clearly. Many sunglasses even come with treated lenses that provide additional benefits based on your surrounding conditions. These sunglasses are incredibly stylish, yet effective on the water. The lenses are polarized to prevent glare and improve vision. It also implements unique color technology. At first glance, the lenses are simply green. However, they block yellow light while boosting reds, greens, and blues. This improves contrast and definition. 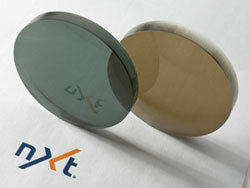 While the lens is made from glass, it is considerably lighter and more resilient than typical glass lenses. The nylon frame is designed to fit snuggly on any sized head. The frame also utilizes stainless steel hinges that resist corrosion. It is also available in a multitude of colors, allowing you to choose a pair that fits your style. The Flying Fisherman Boca Grande sunglasses are carefully crafted to provide optimal vision in even the toughest of environments. The lenses are made from ophthalmic glass and are treated to provide numerous benefits. The first of those treatments is AcuTint polarization. It eliminates glare and reflections while sharpening images. The lenses are also colored to filter out certain colors and UV rays. You can choose to get an amber and green lens or a smokey blue lens. Regardless of the color lens you choose, the sunglasses provide 100% UV protection. On top of all of that, the lenses are hard coated for strength and mirror coated for style. The frame is contoured so that it sits snuggly on the head. It is rather chunky, but the large size only improves the fit of the sunglasses. Additionally, the larger lens size provides more coverage and protection. While the Warrant sunglasses from Suncloud may be on the lower end of the price spectrum, they certainly doesn’t skimp on protection and features. The polarized lenses are made from polycarbonate, keeping the weight down while still being durable enough to withstand some wear and tear. The lenses are also quite large. They fully cover the eye and have very little light leakage. The curved frame is made from nylon and is designed to fit on larger heads. These shades come in 5 different colors, all with different lens colors. Overall, it is a great option for guys on a budget that still want a quality product. These sunglasses actually have a lifetime warranty. Should they experience significant damage, Suncloud will replace them free of charge. These sunglasses from Revo have your eyes covered in even the brightest fishing environment. They’re made of durable plastic and contain polycarbonate lenses. This tough material is resistant to abrasive damage and can hold up well to drops. The lenses are coated to provide you with 100 percent UV protection. They’re also polarized. 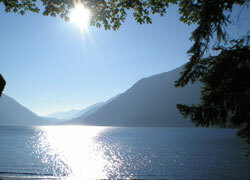 The high-contrast polarization gets rid of glare and can improve your vision on the water. You’ll be able to see past the glimmer and get a clearer view of your target fish. In terms of design, these glasses are sleek and stylish. The contoured frame is made to wrap around your face. This provides you with a bit more protection around your eye area. The nose pads are made of a slip-resistant rubber to prevent the sunglasses from coming off while you’re reeling in your big catch. Revo makes the glasses in neutral black and brown. If you want a pair of sunglasses that can withstand the rigors of a fishing trip, consider this pair from Smith Optics. Every component of this accessory is built to last. The frame is thick and curved to match the contours of your face. The lenses are tough and designed to prevent distortion. They’re tapered from the optical center to ensure that light waves are directed into your eye. This results in a clear picture of your surroundings. The lenses are also polarized to reduce glare and improve clarity even further. If you’re worried about water getting in the way, you’ll be happy to know that these glasses have a hydrophobic coating. They’re available in four distinct shades. This pair of sunglasses is a bit of a unique choice in terms of appearance. It uses an interesting nylon frame that doesn’t go around the entire lens. The lower half of the lens is exposed, which could ultimately lead to a more comfortable fit. The lenses are polarized and made from polycarbonate. They are rather large in size, ensuring that the eyes get maximum coverage. They are also tinted in a variety of color options, allowing fishermen to choose the right color for their environment. The sunglasses come in a variety of frame styles as well. While it is a great option for fishing and being out in the water, they are designed to fit in a casual environment as well. If you are looking for a high quality pair of sunglasses, the Chief by Smith Optics is a great option. 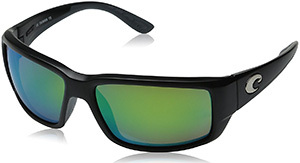 Not only is this pair of sunglasses incredibly stylish, but it is durable and effective for fishing. The lenses are photochromic and made from strengthened glass. They are also polarized and hydrophobic. Essentially, these sunglasses have all of the best features packed into a sleek and comfortable design. The frame has a unique design that covers a large portion of the face. Thanks to the large frame, the lenses actually cover more of your eyes compared to other glasses. It also uses stainless steel components to resist corrosion, even if you expose it to the salty air of the ocean. Smith Optics provides a number of different frame and lens style options. They have a variety of different lens color choices, all providing improved optical clarity in different environments. From Flying Fisherman is this pair of sunglasses that are designed to overcome the many obstacles that you have to face when you’re out on the water. The frame is flexible and light. It wraps around your head for a tight and comfortable fit. The bottom portion of the sunglasses has no frame. This helps to keep the weight down and ensures that your vision isn’t distorted. A non-slip rubber nose piece keeps the sunglasses in place. The lenses are polarized and provide you with maximum UVA and UVB protection. They also utilize AcuTint technology. This technology works with the polarization treatment to filter glare and provide clarity without causing color distortion. The lenses are also resistant to impact damage and scratches. They’re available in three frame and lens shades. Choosing the right pair of sunglasses is important. You’ll want to find a pair that works with the type of fishing you’ll be doing and the environment you’re in. 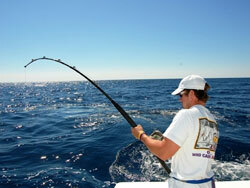 Many manufacturers include various features to aid you in your fishing endeavors. You should consider which features you will need prior to making a decision. Polarized lenses are an all around good feature to look for in a pair of sunglasses, regardless of what they are being used for. Polarized lenses help to prevent strain and damage in the eyes. They reduce up to 98% of reflected light, ultimately reducing glare. They improve overall clarity, allowing fishing enthusiasts to see more detail in the water. These lenses are a bit of a step up from standard polarized lenses. They are adaptive, changing their tint based on the amount of UV rays present. It is a great option for fishermen who will be on the water all day. These sunglasses will constantly change, providing you with the best vision possible. Generally, lenses designed for outdoor use are made from one of two materials: polycarbonate and NXT. 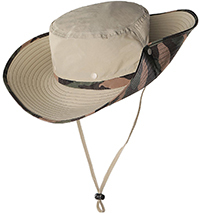 Either material is great for fishing and rugged activities on the water. That being said, the two materials are not made equal. Polycarbonate is generally cheaper than NXT. It is impact resistant, but still prone to damage. NXT is stronger than polycarbonate. It is virtually unbreakable and incredibly light. That last quality makes it the ideal material for running sunglasses where you will be wearing them for prolonged periods of time under moving circumstances, but also for golf sunglasses or fishing where the toughness provides optimal protection for your eyes from flying objects like golf balls or fishing hooks. Choosing a pair of sunglasses with colored lenses can be beneficial based on the conditions you’ll be fishing in. Different colors provide various improvements. Gray lenses enhance color and depth perception. They will allow you to see well in deeper waters. Copper lenses filter out blue light, making them ideal for spotting brightly colored fish and obstacles. They are also great in low light conditions, improving your vision during sunsets. High quality sunglasses often come with some type of coating. Hydrophobic coating is one of the most popular options. It repels water to ensure that the occasional water droplet doesn’t affect your vision. Lenses may also be coated with chemicals to make it fog proof. These are great for humid environments. The actual frame of the sunglasses is just as important as the lenses. Not only do you want to ensure that the frame fits your face, but you’ll want to make sure that it can withstand whatever you throw at it. Wrap around frames are a great option for guys who are fishing on a boat. They’ll stay on your face regardless of how strong the wind is. You may also want to look for straps or bands for added security. There are also floating frames available, making it easy to spot and retrieve a lost pair of sunglasses. Additional frame features can make wearing the sunglasses more comfortable. Venting will keep you cool in the sun while a protective skirt will ensure that no debris gets into your eye. If you already wear prescription eyeglasses, you can easily get a custom pair of prescription sunglasses. You’ll be able to pick all of the features you want, from frame style to lens coating. The pair will be truly customized for your eyes. In the end, you’ll have the protection you need with the vision correction you are used to. Whether you’re fishing off a pier or in a boat, you should always make room for some additional accessories. While your glasses alone will do most of the protecting work, these extras can make your experience much more safe and comfortable. The last thing you’ll want to worry about when you snag that fish is losing your glasses in the water. It’s a good idea to invest in a neck lanyard or flotation device. Neck straps attach to the ends of both earpieces or on the temple supports. The strap itself sits on the back of your neck. Should your glasses come flying off, the strap will catch on your neck and save you the trouble of finding your glasses in the water. The same goes for a flotation device. You can invest in floating straps or attachable floaters. Either way, the device will keep your glasses on top of the water’s surface for easy retrieval. Your sunglasses are bound to get dirty on your fishing trip. Whether it’s muck from your gear or leftover greasy sunscreen from your fingers, that mess will affect your vision. Having a specialty cleaner on hand will help to ensure that your sunglasses stay pristine. Furthermore, the alcohol in the cleaner will be able to cut through tough grime that a cloth can’t get rid of alone. A great pair of quality sunglasses can do wonders for your overall eye health in the long run. However, there’s a lot more you can do to keep your eyes safe. Put these tips to good use while you wear your sunglasses so that you have all your bases covered. While it may seem like an obvious tip, it’s an important one that’s worth noting. It’s not uncommon for people to look at the sun when they’re out on the ocean. You may be looking for the sun’s location for navigational purposes or take a glimpse to see what time of day it is. Either way, this brief look at the sun can cause significant damage, even if your sunglasses are on. You can get sunburn on your eye and you may develop cataracts and vision loss in the future. There’s nothing cooler than the sunglasses and hat combo. Not only does it look cool, but it can help to make sure that your eyes are completely protected from the sun. Even with sunglasses on, parts of your eye are being exposed to direct sunlight because of the small gaps between the accessory and your skin. Skin cancer can develop under your brow or on your eyelid. To prevent this, wear a hat that has a brim that’s at least 3 inches wide. If you buy cheap sunglasses, you might as well not wear them at all. Cheaper sunglasses don’t offer the types of protection you’ll need to keep your eyes safe. Essentially, they only tint or block out a small portion of light. They don’t filter out the harmful UVA or UVB rays. Sunglasses are one of the most important things you can invest in whenever you plan on spending any amount of time in the sun. Go for sunglasses that block out at least 99 percent of UVA and UVB rays. They should also filter up to 90 percent of visible light. If you want the best in vision and protection, high-quality polarized sunglasses are the way to go. One of the biggest mistakes people make is leaving the sunglasses at home on overcast days. It’s a common misconception that the clouds provide protection from the sun. In reality, you’re still being blasted by UVA and UVB rays. It may reduce visible light, but the light that is coming through is still harming your eyes. You should always wear sunglasses when the sun is out, regardless of its intensity. When people get sand or dirt in their eye, their first instinct is to rub it out with their hands. This can do more harm than good. Even a single piece of sand can cause significant damage to your sensitive eye. Rubbing your eye with your hands will cause the dirt to move around further and scratch your cornea in the process. Not only that, but you’re running the risk of adding more dirt to your eye. If you get something in your eye, you should flush it out with clean water and blink repeatedly until you feel relief. If the problem persists, you need to contact your eye doctor to avoid further abrasive damage and infection. Even if you don’t have anything in your eye, you should avoid touching it with an unclean hand. It can lead to the spread of conjunctivitis and other infectious diseases. Sunscreen should be applied on every part of your body that’s being exposed to the sun. This includes your eye area. Many men neglect to apply it to this sensitive area. This can lead to significant damage.While it may be surprising, around 10 percent of skin cancer issues are found in the eye area. You should always apply a mineral-based sunscreen that’s specifically formulated for your face. These types of sunscreens are effective and won’t irritate your eyes. They should have an SPF level of at least 30. You should drink plenty of water while you’re fishing to avoid the effects of dehydration. Dehydration affects your entire body, including your eyes. When you don’t have enough water in your system, your eyes can’t produce the tears they need to stay hydrated and healthy. This can lead to dry eyes and vision problems. Keep that bottle of water filled to ensure that you don’t experience any lasting problems. Can polarized sunglasses help you see features under the water’s surface? The polarizing effects of your sunglasses can help to distinguish rocks, fish, and other life wildlife under the water to some extent. Polarized sunglasses are effective for getting rid of glare off the surface. This alone can make a dramatic difference. Furthermore, reflections from the sky above are decreased. Light reflections coming from underneath the water are also polarized. If you’re looking at the water from an angle, it’ll appear darker and clearer. Is polarization affected by the time of day? The effectiveness of polarized sunglasses changes depending on the position of the sun. The effects are at their best when the sun is at a 37-degree angle from the horizon. The exact time will depend entirely on where you are in the world. Generally, the sunglasses will effectively filter glare if the sun is between 30 and 60 degrees from the horizon. Is polarization affected by how choppy the water is? Because the polarizing filter is affected by the angle of the sun, choppy water will change the way the sunglasses perform. The sunglasses will filter glare differently on each wave depending on its height and slope. With that being said, choppy water can help to reduce glare when the sun isn’t in its optimal position of 30 to 60 degrees. This usually occurs when the sun is too high or at a low angle from the horizon.